Devil May Cry Wallpaper: . :The Grunge Devil:. Minitokyo »	Devil May Cry Wallpapers » Devil May Cry Wallpaper: . 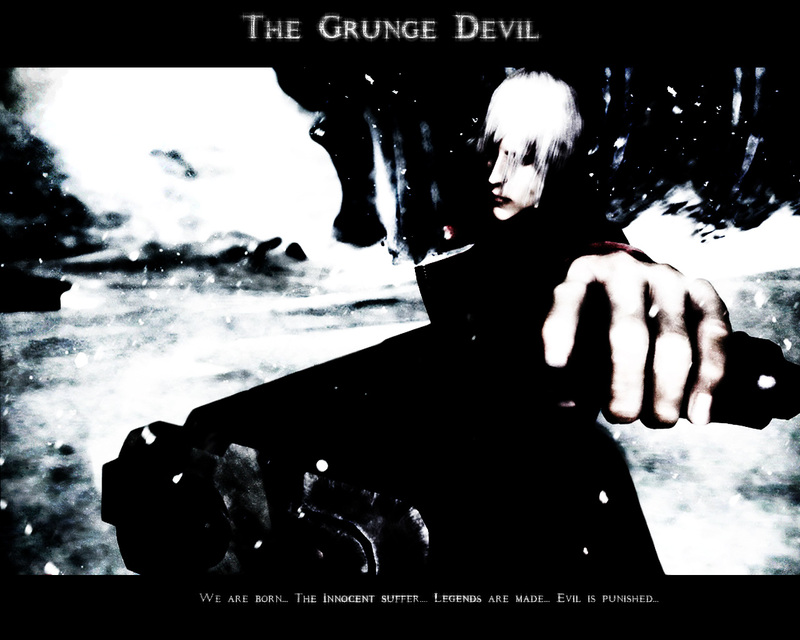 :The Grunge Devil:. Description:The Devil has many reasons of being AN enemy of GOD... People thought of him to be feared... The Devil himself changes his physcial form, everytime he gets injuried by fightning God himself.Why would he fight God over and over when, at times. He was about to die by this close. Even if the Devil is possibly take down God... Hell it self will rise again, exploreing chaos throughout the Earth or bring paradise. People still asummes The Devil is evil... But they wouldn't know which one is evil or not... The light is not always the saviours of humans... at rare occasions... Another type of evil can only can face up againest Evil. As you recenetly heard...our dear...Sammo...One of the best big time wallers of mt has just left the building. Praise to sammo! The Devil him self might even get you when your not paying attention to your surrondings in the dark. Does the physical image look Familier to you? Sammo....a devil?! Well he is a hell of a waller but it's a shame he have to go. Anyways, the wall looks scary in a way. Great grunging as usual. Great job! Yes sammo will be missed. Nice pick of scan i must say , looks awesome witht eh style. i like the rusty kind alooks looks pretty awesome. wtf!?!? sammo left?! this is news to me, what the hell happened? anyways, as i said before its a pretty solid wall, my only complaints are the text and as i told you, the gun is hard to make out. Wow, the effect is really neat. I have it on my desktop just now and I could stare at it for ages just noticing little bits and pieces. Really nice work :) . The borders are the only problem, I have with it atleast. I just dont like the font selection and such though, but it's still a great wallpaper. That;s crazy. The front is a little weird, but besides that, great wall! The effects are amazing! Excellent job! really cool wall there... i love the colours (as usual), just the fact that there's a little bit of red in there... anyways, love the effects, great job! omg!!! Cool Devil May Cry wallpaper. The grungeness of it is amazing and the aura it gives is amazing. +Fav. Keep it up Shadowdude. O_O that ps3 screenshot was so awesome and now you walled it. however, i don't like the fact that you can't see the gun, only a small part of it. Evil laugh nicely done with the use of the darkness i mean colours. but u should have insert a bit of red, becos this is devil may cry anyway good Job.